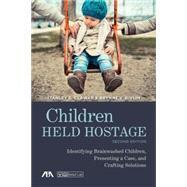 by Clawar, Stanley S.; Rivlin, Brynne V.
In Children Held Hostage, Stanley Clawar and Brynne Rivlin use important new research involving over 1,000 families to demonstrate that children can and are being used by parents in the divorce battle. Their research shows how negative actions by parents toward their children show up in court proceedings where children testify or are questioned by mental health professionals. The major issue in confronting this problem of programmed and brainwashed children has been identification of a child alienated by one parent against the other; proving it in court; and then finding a solution that not only works, but that a court will buy into. The updated edition of Children Held Hostage explains these issues in detail, with practice-focused explanations on every step in the process. The authors offer further insights into gender issues and differences. Other new material includes a social-psychological profile of programmers and brainwashers; identification of the most commonly asked questions by judges, target parents, lawyers and children; an expanded social explanation to the causes, impact, and interventions; development of an abductor profile; charts to visualize key findings and processes; and much more. Dr. Stanley S. Clawar is a Professor at Rosemont College, Chair of the Clinical Sociology/Sociological Practice, Forensic Sociology/Criminology, and Deaf Studies programs. Dr. Clawar is Director of Walden Counseling and Therapy Center in Bryn Mawr, PA.
Brynne Valerie Rivlin is a licensed clinical social worker practicing individual, child, and family therapy at Walden Counseling and Therapy Center in Bryn Mawr, PA.